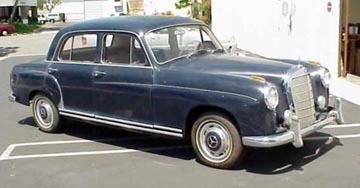 In June, 2002, Chris drove his new Mercedes-Benz Ponton from Huntington Beach, California to Dallas, Texas. He bought the car sight unseen and experienced no problems (with the car) along the way. It is hard to think of what to say about the trip. I took pictures of lots of things along the way, but not all that many of the car itself, I guess. We headed east towards the Mohave Desert. Unfortunately, we ran into a huge traffic jam east of Los Angeles and ended up cooling our heels in the little town of Apple Valley. As evening approached, we started off once again and ended up crossing the desert at night. Not the original plan, but probably a good idea in a dark colored car without air conditioning. 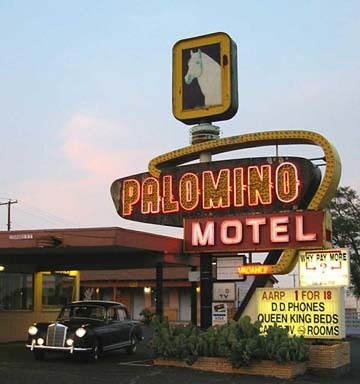 Our first sleep came in Kingston, Arizona, just over the California border. At a highway crossroads, miles from any town, we came across an "old west village" that was once someone's tourist trap. 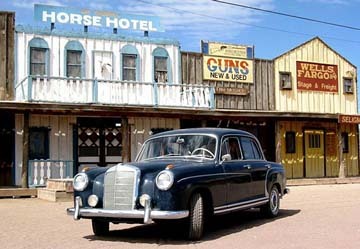 It still makes a nice backdrop for a Ponton, even if it is not an authentic ghost town! The first day had been a long one, so we only went as far as the Grand Canyon the next day. Having time out of the car to stretch our legs and walk around was a relief and the scenery was beautiful. Even though it was late June, the tourist crowds seemed fairly small. In Flagstaff, Arizona, the hotels were full and overpriced, so we went on to Winslow for the night. Awakening to TV reports that the huge forest fire was growing worse, we tried to head out early. Only as far as Holbrook, Arizona (33 miles) the smoke was thick and getting thicker. We were now about 50 miles north of the fires which had grown to over 500 square miles! With the winds from the southwest, we drove in more than two hours of dark smoke. The sun was nearly blotted out at two o'clock in the afternoon! The next stop was Santa Fe, New Mexico with lots of healthy restaurants, clean mountain air and cooler weather. We spent almost two days there, just getting over the smoke and relaxing. 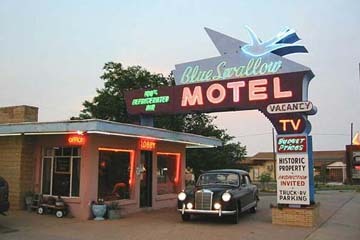 Note the Blue Swallow Motel has 100% Refrigerated Air! There is a little garage next to each motel room for your car. All during the trip, we took side routes from I-40 onto old Route 66 where we could find it. Sadly, not many of the old interesting buildings remain. 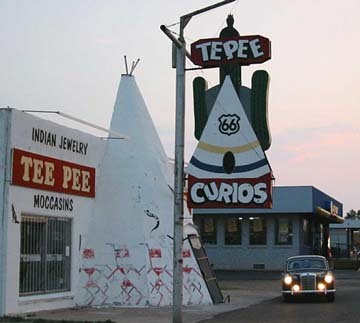 Even in Tucumcari, which has a huge Route 66 history, has fewer examples than my last trip through town seven years ago. 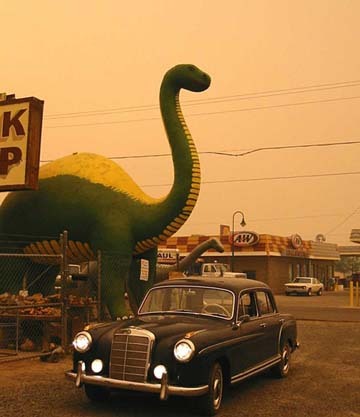 From Tucumcari, it was a short trip to Amarillo, Texas and from there on to Dallas. A five day driving adventure through the southwest United States. There were plenty of problems along the way - forest fires, a mugging in Santa Fe that happened right in front of us, full hotels and a thunder burst or two, but no problems with the car at all.